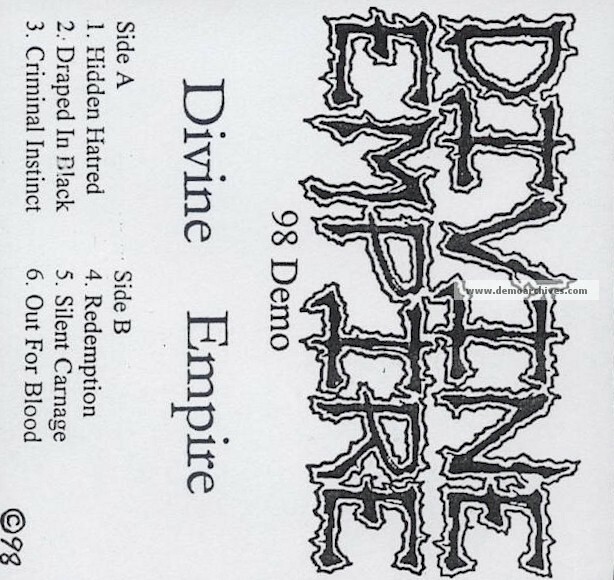 Divine Empire was formed in late "97" by Jason Blachowicz, J.P. Soars & Derik Roddy, the trio played together on Malevolent Creation's sixth cd "In Cold Blood". Jason is Malevolent's original "Thunderous" bass player performing on their first six albums during a ten year career with the band, so yes there is definitely Malevolent blood in this band. The trio quit Malevolent on different occasions due to personal reasons. They connected well when they jammed together & weren't doing anything at the time, so the three of them stayed in contact with one another, then decided to reform & record a seven song demo achieving interest from many labels. Signing with "Olympic Recordings" distributed through Mercury & resulting in their first album "Redemption" released in "98", which did very well & landed them on two successful major U.S.Tours, one with Cryptopsy, Gorguts & Vader, the other with Witchery, Borknagar & the almighty "Emperor"! Pro printed covers and cassettes. Came with an inlay with linear notes. No lyrics.